Available Nov 21st, Trumping Democracy: Real Money. Fake News. Your Data. from Cinema Libre Studio on Vimeo. "TRUMPING DEMOCRACY," the explosive new documentary directed by Thomas Huchon from Europe’s popular SPICEE news network, follows the money behind the ultra-conservative faction that quietly engineered itself to power, via the campaign of Donald J. Trump. Cinema Libre Studio has acquired the rights to the film in the U.S. and English-speaking Canada, and is fast tracking a streaming release on November 21, followed by DVD on December 5. 77,000 votes in Wisconsin, Pennsylvania, and Michigan won Trump the Electoral College vote, despite his 2.8 million popular vote loss. "TRUMPING DEMOCRACY" proves this was not chance, luck or a free and open democratic victory. This was a hijacking of the Electoral College, by a puppet master named Robert Mercer who manipulated the 2016 election by influencing voters using their personal data, fears and vulnerabilities, while targeting them right down to the zip code level. 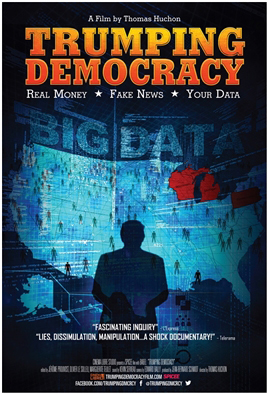 "TRUMPING DEMOCRACY" is the first documentary to make the connection between Mercer (the reclusive ultra conservative mega donor) with Breitbart News, data firm Cambridge Analytica, questionable campaign financing and Facebook dark posts. A connection that paved the way for the strategic takeover of the Trump campaign -- and ultimately, the White House – by Mercer and his puppets-in-chief, Steve Bannon, Kellyanne Conway and David Bossie. Headlines are swirling around Russia and Wikileaks and their potential connection to Cambridge Analytica, as well as the complicit behavior exhibited by social media giants like Facebook and Twitter while in pursuit of political advertising profits. It is imperative that the public is made aware of the depth of deceit, the connections within the global uprising of nationalist agendas and that it comprehends the risk that our own data now poses to the democratic process. “In such a highly developed country as the USA, I find it unimaginable that an election could be manipulated. I could never have imagined this to be true. We know that for democracy to flourish, the citizenry must be well informed, and as TRUMPING DEMOCRACY highlights, the democratic process was hijacked, and nobody saw it,” director Thomas Huchon said. Donald Trump became the 45th President of the United States by winning three key states, a victory engineered by an ultra-conservative faction that quietly mapped its way to power using fake news, lies and psychometrics. This explosive documentary follows the money to the reclusive multi-billionaire Robert Mercer, who bought Breitbart News and funded the effort while inserting Steve Bannon into the presidential campaign as its manager. Using the data of millions of Americans acquired from Facebook, Google, banks, credit companies, social security and more, Cambridge Analytica, another Mercer-owned company, used tactics honed during the UK’s Brexit campaign to identify voters deemed “most neurotic or worried,” whom they believed could swing for Trump. In the darkness of the web, democracy was trumped by data. Experts include: Psychometric scientist Dr. Michael Kosinski, PhD Psychology (University of Cambridge); David Carroll, associate professor of media design at the School of Art, Media and Technology at Parsons The New School for Design; Rosie Gray, Whitehouse Correspondent, The Atlantic; and Brendan Fischer, Director, Federal & FEC Reform at the Campaign Legal Center, a Washington, D.C.-based non-partisan nonprofit, the tracks campaign finance, government ethics and political transparency.